Danberu nan kilo moteru? will be one anime that will make you want to prepare for the summer. Yabako Sandrovich and MAAM’s How much heavy dumbbells can you lift? (Dumbbell Nan-Kilo Moteru?) is a manga featuring high school girls trying to slim down for the coming summer. The manga is getting an anime adaptation and we cannot be happier. 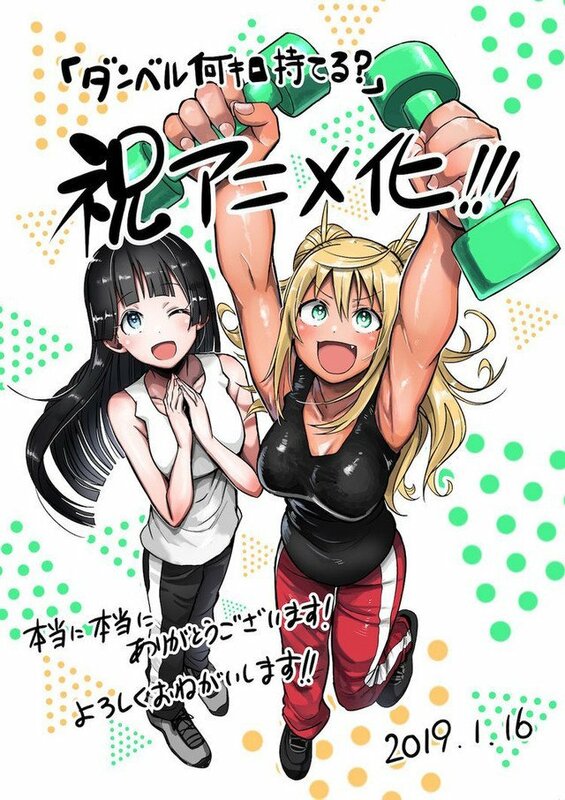 The comedy manga centers on the theme of weight lifting, more specifically, dumbbells. The story centers around Hibiki Sakura, a high school girl who looks to bodybuilding in order to slim down. She love eating but now wants to take up a diet but realises that alone will not be enough. Upon joining the gym she is greeted by the beautiful and cheerful, Akemi Sōryūin, student council president who has a muscle fetish.Sakura wants to impress her friends by showing up with a slim body by summer time. Will she succeed? The cast for the anime so far is Ai Fairouz playing for Hibiki Sakura, and Sora Amamiya playing for Akemi Sōryūin. Mitsue Yamazaki will be serving as the director for the anime at Doga Kobo. We have Fumihiko Shimo in charge of the series scripts, while Ai Kikuchi will be designing the characters. With the anime adaptation making its entry in this Summer the official site has put out a new illustration to mark the anime adaptation announcement. If is definitely going to be a fun anime to watch for the boys. Well, we can expect people to enjoy the idea of being in shape from this anime. If you look forward to this anime do let us know in the comments section below.